For all Opera lovers, Opera 56 Stable version has been released along with many interesting features and updates. From User Interface to Security and Privacy, Opera 56 brings something new for the users . Opera community is smaller than Google Chrome and Firefox but if you are a multitasker, you will love Opera 56. Opera boasts features and addons which are not yet present in competing browsers. 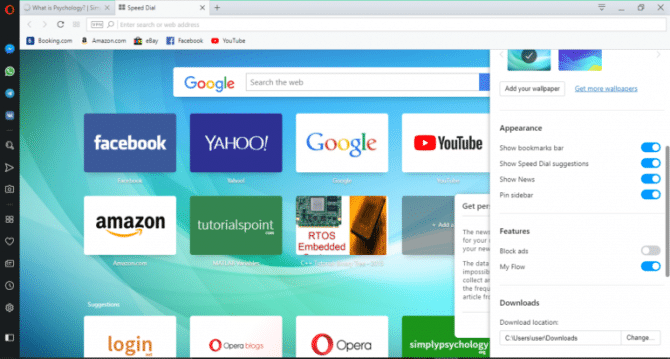 Opera is an all-in-one browser which has built-in features like free VPN, instant search, personal news, battery saver and enhanced user interface which is highly customizable. Opera 56 brings in features like video pop out volume controls, scroll to top for tabs, zoom level indicator and enhanced settings. Let’s discuss about the new features of Opera 56 and then go directly to Opera 56 final version offline installers direct download links. 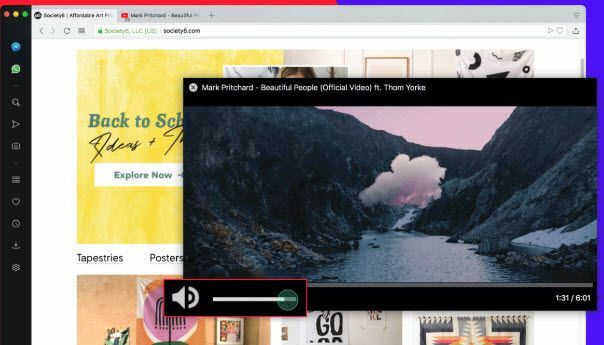 Google had introduced picture-in-picture mode in Chrome 69. Opera had the same feature called video pop out for ages. Now they have introduced volume controls on the video pop out screen. The video pop out screen remains on top of all windows so that the user can do work while the video plays in parallel. If you are going through a long page and want to go to the top of the page, Opera 56 makes it easier for you to scroll through. If you want to go on top, click on the active tab and you’ll be taken on top. Clicking the active tab again will take you to the position where you were earlier. You can use the Page Up/Page Down and Ctrl + Home and Ctrl + End keyboard shortcuts but these will not remember your current scrolling position. This scroll feature can be enabled by going to Settings –> Advanced –> Browser –> User interface and click on “Scroll to the top of page by clicking the active tab”. Opera 56 adds yet another icon on the address bar. If you change the zoom level of a web page by using Ctrl + + and Ctrl + – keyboard shortcuts, a new magnifying glass icon will show up in the address bar. This icon can be used to either reset or zoom in/out the page further. In my opinion, Vivaldi does a better job at zoom level indicator as it displays the zoom indicator in the status bar of the browser. The settings page of Opera 56 has also been enhanced. Now the settings are grouped into categories. The user can easily click a category and can change similar settings easily. This is very similar to Google Chrome. Here too, I would say that Vivaldi does a better job at organizing the settings. These features may give you a reason to try out Opera browser. Unlike other browsers which have different addons for VPN browsing, Opera 56 provides an in-browser VPN which is free and fast. Just go to Settings -> Advanced ->Features->Enable VPN. Your VPN will be enabled. Now you can secure your IP address and can access to any website in any region. The VPN service can be enabled on specific sites as well as on the browser as a whole. Battery Saver allows you to save your battery when your laptop is unplugged from charging. THis featiure works better when you enable blockAds option too. It improves the performance by reducing the activities in the background. However if you want to play video games then just switch it off. Go to Settings -> Advanced ->Features->Battery saver to access this feature. Without leaving the current website, search the web using Instant Search. You don’t have to open another tab to perform another search. The previous page gets faded and new page can be viewed clearly. Press Alt+Space to search on the web or search for open tabs or Ctrl+Space to search for only open tabs. You can also click the button in address bar for Instant Search. This feature allows you to work simultaneously or multitask while watching a video. The video screen will be pooped out from the other screen on which you are working. Thus unlike other browsers where you can only watch a video or do some other work. It allows to do both tasks at the same time. You can control the volume by the volume bar appearing on the side of the video displaying window. 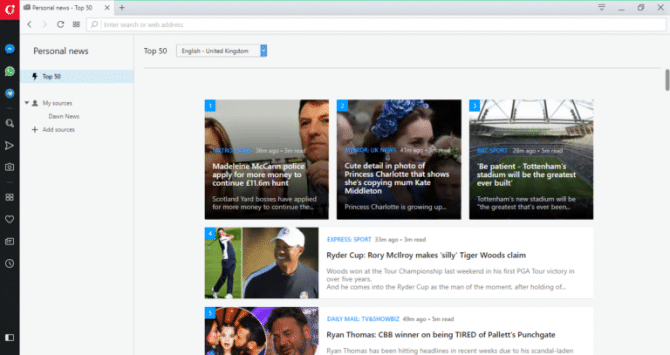 Personal news is just like newspaper with additional feature that its get updated according to the time span you select and you can get updated news from any of the region of your choice. You can get this feature by going into Advanced Settings. Once you set the time and select the above options. you will get this window. However the content will be displayed according to the region you have selected. Opera Turbo helps you to speed up your web browsers by improving its performance. It is particularly handy for slow connections where data and images are compressed on the back end as compared to its original size. However security and privacy still not compromised while availing this option. As when you access any bank or some other sensitive site, instead of compressing the data, original data is displayed. The start page has been enhanced including the address bar. On the side bar there are different options like snapshot, whats app, messenger, speed dial etc. You can add more option by right clicking on the side bar. There are also improvements in User interface. You can chat and search websites, read an article at the same time. Besides that you can take snapshot of the window you are currently browsing. You can change appearance of the start bar by clicking on the Easy Setup tab on the right corner of the screen. Installation is simple. Just download the opera browser and follow the installer instructions. Basically you can install it by clicking Next button a few times until the installer starts installing the browser. If you already have installed Opera, you may want to go to Opera Menu –> Update & Recovery and check for updates. If the updater finds any update, it will automatically download and alert you to install it.